As the release of Deathly Hallows draws closer, bookstores are worried about how to attract customers. Other bookstores have been planning since the release of Half-Blood Prince. 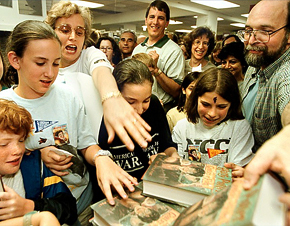 Most bookstores are ringing in the release of the final book by throwing a party. Others are just...selling them. 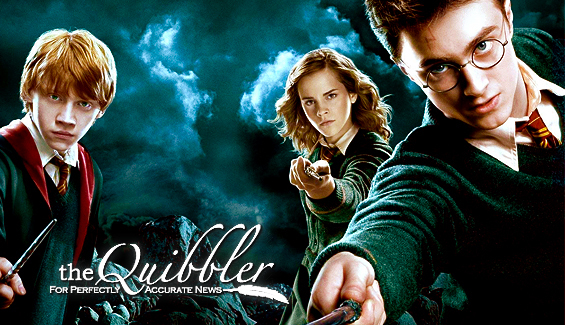 This article will take you through the many ways booksellers are going to promote Harry Potter. Most bookstores have the option of pre-ordering the last Harry Potter book. Usually,if you pre-order it,you get a discount. (i.e. 20 % off!) Even websites are doing this! Some of these include Amazon, Borders.com,and Barnes & Nobles.com. Another way they bring in the customers is with a "Potter Party!" The parties will include things to entertain the customers,such as magicians,contests,and costumes. The contests may include the "Write the First Chapter of Deathly Hallows Contest", which is...what it says. Another contest some may have is the "Harry Potter Costume Contest",where you dress up as your favorite character. Some prizes that will be awarded may include a free copy of Deathly Hallows or free tickets to see Order of the Phoenix. Most bookstores will probably have a refreshment stand. There you can drink (not that way!) and eat some snacks. Some may even have "Potter" themed food and drinks. One tip for people going to a "Potter Party" at a bookstore: DO NOT SCREAM OUT THE ENDING OF THE BOOK!!!!!!!!!!!!!!!!! I can't stress this enough. People will get extremely mad at you, some may cry( ;]),and you will definitely get in trouble. Would you like it if somebody screamed out the fate of Dumbledore at the release of Half-Blood Prince? Didn't think so. So whether you are going to a small bookshop or a large bookstore, I'm sure they will have a fun "Potter Party". If you would prefer staying at home and reading quietly to yourself...well,have fun.